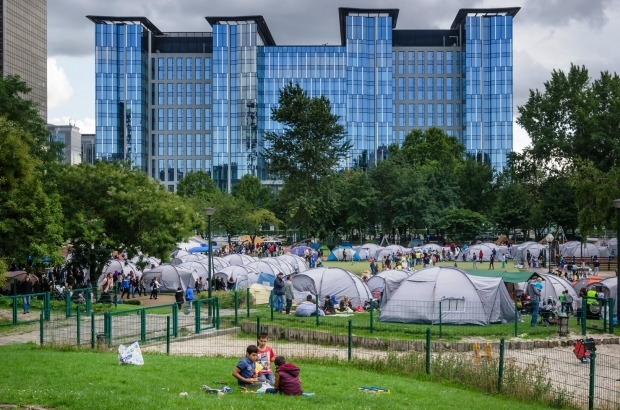 A plan to offer temporary accommodation to asylum-seekers waiting to be processed has met with little response, a result, said federal migration minister Theo Francken of the overwhelming success of the tent camps in local parks. The federal government has opened up floors of the WTC-III tower in the North Station area in Brussels to refugees awaiting processing, with space for up to 500 people. At present, those who cannot be processed on a given day are sent away with a future appointment and have to sleep in the tent city created by the Red Cross in nearby parks. The Office for Foreigners worked over the weekend to try to clear the backlog of applicants, but the stream continues unabated: on Monday, 700 new arrivals lined up at the doors; the office is capable of handling about 250 in a day. On Monday evening, only 14 people showed up to take advantage of the WTC bed space. On Tuesday, another 24 took advantage of the indoor facilities. The problem, according to the Red Cross, is that the accommodation is for sleeping only; in the morning, refugees have to leave the premises and presumably return to the park where they can obtain food, clothing and medical attention. The refugees, they said, would rather stay in the park with their belongings rather than carry everything back and forth – and lose a place in the camp they may have obtained. Refugees, particularly those with children, the Red Cross said, also prefer a tent, which allows some privacy, to the offer of one room full of cots. The organisation now plans to improve distribution of its flyers, in English and Arabic, giving precise details on the accommodation available. New applicants who turn up today at the Office for Foreigners can expect their processing to be postponed until next week.